5 years, 50 exhibitions, and 1200+ artists later, Worksound closes it's gallery doors and prepares for an ambitious future. The overspray on the stenciled letters of WORKSOUND — black spray paint on a haggard yellow board that clearly has had previous lives before serving as a sign above the door—makes a fine metaphor for what has happened at this Eastside alternative art space for the past five years. Worksound booked over 50 exhibitions in that time, yes, but also hosted performances, poetry readings, lectures, and music shows ranging from experimental music to a performance art band. Worksound worked with more than 1200 artists, musicians, performers, poets, and film makers. And the artists came to the poetry readings, the musicians came to the art exhibitions, and the poets came to shows. This overspray in curiosity and attention on the part of the Worksound audience is what helped to make it one of the more interesting art spaces in the city. 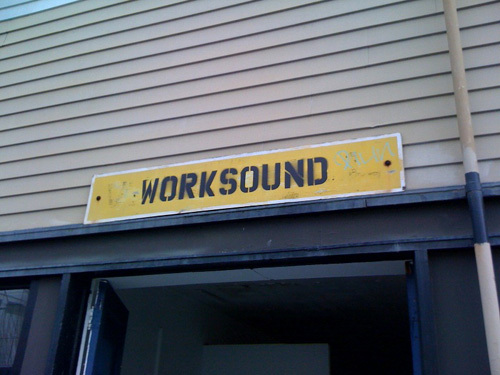 The Worksound sign. Photo via Small Doggies Magazine. Worksound’s mission is to cultivate experimental and innovative contemporary art….Worksound will collaborate with artists, writers, musicians in production of new works that challenge boundaries of conventional practices, while encouraging broad public appreciation and access to arts and contemporary culture. Worksound wants to be place where different disciplines and audiences converge and cross-pollinate, through curatorial innovation and depth of programming in diverse media. 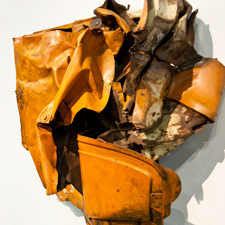 The last Friday of every month, the wide sidewalk in front of the nondescript Eastside building would be crowded with a cross-section of Portland artists, curators, critics, fans as a new exhibition went up. But just as importantly, bands were rehearsing and recording every night in the spaces on the south end of the building. 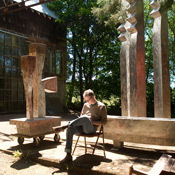 And in the last year Worksound invited artists in for longer residencies to make work and then exhibit in the space. Highlights? Who can choose from 1200 artists? To give a sense of the scope of what happened here: Nadia Buyse, MFA ’12 (Ghost Mom), mic in hand, slowly walking the space from one end to the other leaving a red trail from her “bloody” feet; Sean Joseph Patrick Carney, MFA ’09’s stand-up/performance hybrid, Oh did I assassinate your penguin? ; Nan Curtis’ blanket fort for House Arrest; Bruce Conkle’s suspended sculpture halfway between machine and internal organ, oozing pink goo; Stephanie Robison’s stark white crumpled, almost figure-like forms; Stephen Slappe’s creepy video installation, Cul de Sac; Poor Claudia and Octopus Books’ Bad Blood poetry series. 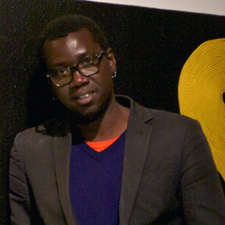 Modou Dieng. Photo by Annalise Reinhardt. Dieng took the lead in curating the space, but also invited more than 30 curators to put together group shows. There were curators from Portland, but also from New York, Brussels, San Francisco, and Melbourne. Ryan Pierce, MK Guth, Vanessa van Obberghen, Steve Slappe, Victor Maldonado, Jesse Siegel, Jeff Jahn, Micah Malone, Patrick Rock, Mark Wooley, Melanie Flood, Jordan Dahl, and Kim Donaldson. “We worked within a global agenda, although 70% of the shows were regional artists and directed to a local audience,” says Dieng. Everything has its life span, and Worksound had its final exhibition this fall. But Dieng says, “Worksound as a brand and lab of ideas and curatorial projects isn’t going anywhere. We are only eliminating the gallery option here, because keeping it at this point would be accepting the audience needed to make it an institution which would take our mission out of its trajectory.” Dieng and team will keep the building as studio space with office and lab for new curatorial projects. Dieng is in a good position to contribute to this international dialogue in Portland. 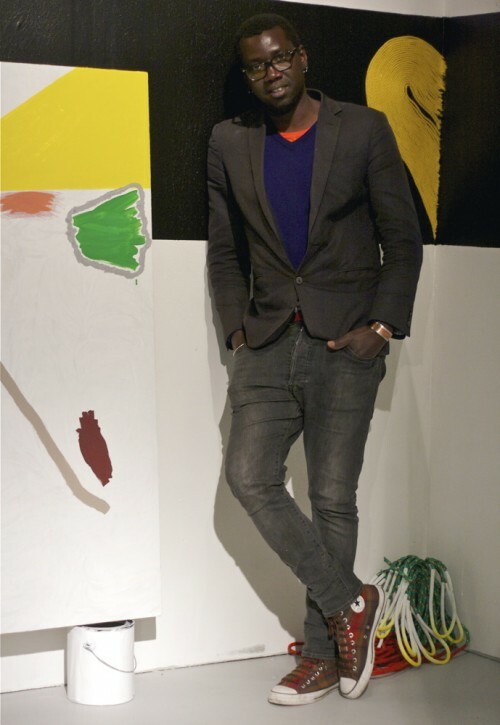 At PNCA, Dieng has long led Global Studies trips to Senegal and most recently Belgium with PNCA students. 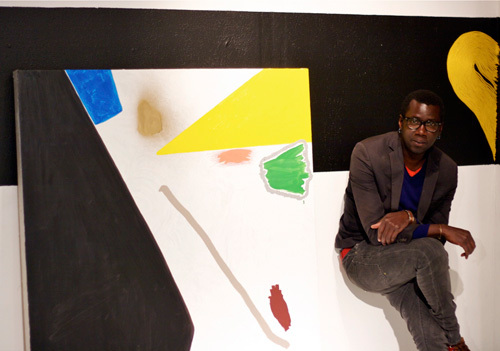 His work is exhibited internationally, and he’s played a role in bringing international artists and curators to Portland. 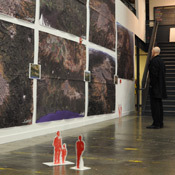 Reminiscing about Worksound exhibitions? OPENWIDE documented many of them. And PORT wrote a post-mortem as well.